Safer than metal, Slice Ceramic Scissors cut materials effectively but resist cutting skin thanks to their patented finger-friendly blades. The scissors can handle a wide range of materials, including paper, fabric, craft supplies, cardboard, and vinyl. Because the blades are so hard, these scissors last up to ten times longer than steel. Soft-touch finger grips line the tough glass-filled nylon handles for the ideal mix of strength and comfort. Great in studio, home, and educational settings alike, these lightweight, durable safety scissors can be used left- or right-handed. They measure 5½" long with a 1¾" cut. The rounded ceramic blades are non-sparking and chemically inert, and they'll never rust. ™ Slice is a trademark. Safer than metal, Slice Ceramic Scissors cut materials effectively but resist cutting skin thanks to their patented finger-friendly blades. 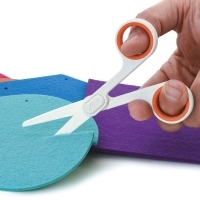 The scissors can handle a wide range of materials, including paper, fabric, craft supplies, cardboard, and vinyl. 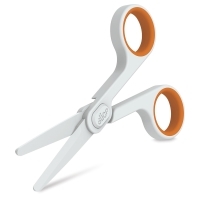 Because the blades are so hard, these scissors last up to ten times longer than steel.